Why retired journalist, author, and part-time local bartender, Fred Moody, came to Seattle and the realizations he came to about the city following the World Trade Organization riots of 1999. How Moody came to view the growth of big corporations like Microsoft and Amazon as positives, rather than negatives. Moody’s thoughts on the future of Seattle, some fun lightning-round answers, and his personal hopes and fears for the city as it moves forward. 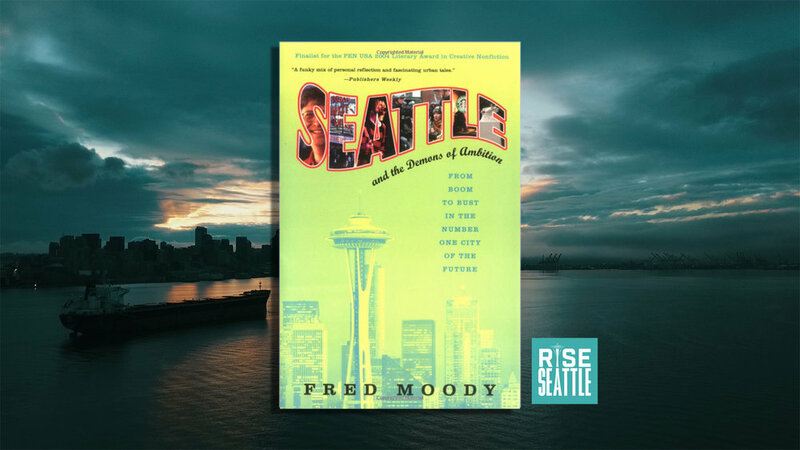 Growing up in nearby Bellingham, author and part-time bartender, Fred Moody, has seen Seattle through some of its highest highs and lowest lows. After moving out of the city in the late 70s to attend grad school in Ann Arbor, Moody found himself missing the pleasant atmosphere of area he called home. He moved back with his wife and child in the 1980s and started a freelance type-setting business. It was a simple, relatively inexpensive life, until the large corporation takeover began. And at the head of it all was Microsoft. Microsoft and other big businesses started making their way into Seattle’s landscape, bringing national attention to the city and drawing in many young, bright-minded people with a love for all things Seattle. Moody recalls speaking with a young woman about why she came to Seattle and her response being that she woke up one day and realized that everything she loved was from Seattle. The grunge scene had taken off in the city and the nation’s first Starbucks had become a massive attraction for locals and tourists alike. While this seems positive on the surface, Moody notes that there was a lot of complaining from natives about Californians and big businesses entering the city and driving up the cost of living and other community expenses. All of this quick growth and expansion soon culminated in an unprecedented event: the World Trade Organization riots. Though every other city that had previously attempted to host the World Trade Organization had tried to warn Seattle of what to expect, Moody mentions that there was an air around that Seattle thought it had a new method of dealing with conflict and would act as a model for other areas. Unfortunately, this plan did not come to fruition and the riots grew out of control. During and in the aftermath of the riots, Moody remembers looking around and realizing that the Seattle he once knew was gone. In its place was a Seattle that represented the establishment, a Seattle that was a nexus of corporate power, a Seattle that no longer matched the image any native had originally held for the city. Being driven out of journalism by the Internet and being a part of a start-up that crashed, Moody had plenty to be “moody” about. However, he slowly came to the enlightened understanding that everything that was happening in Seattle was for the greater good. This understanding began when he started reading through speeches from Bill Gates on his philanthropic pursuits and noticed the work the many spin-offs of the Gates Foundation was doing to pitch in on world health issues. The discovery of these ideals, as well as the environmentally-conscious ideals encouraged by businesses like Starbucks and Nordstrom, led him to understand that every new person who came to Seattle came for a positive reason and that the changes being made should be embraced, instead of fought against. Where he once was against corporate giants like Microsoft and Amazon, he now accepts them as part of Seattle’s future. Seattle has always been a city in question of its own identity, Moody explains. The many booms and busts over the years have altered Seattle’s meaning many times and the natural landscape has always been so breathtaking that every new business that comes in seems to take away from that beauty. There is a constant battle taking place in the city over those who came to find wealth and success and those who came to get away from an entrepreneurial environment. The utopian villages of the 19th century may be gone, but there are still those who see a utopian vision for Seattle’s future. It begins with a continuation of this push for progressive politics in the city and the continuation of entrepreneurs like Bill Gates and Jeff Bezos as agents of change, ensuring that Seattle remains a prosperous city for all. Moody has some definite hopes and fears for Seattle as it moves forward. His biggest fear is that the city will go the way of Detroit and collapse under the pressures of change. His hope is that it will go more in the direction of Amsterdam and remain a thriving city that can survive boom after boom. Whichever way the tides turn, one thing is for sure: no matter who or where you are in Seattle, you will always be able to stop by the North Star Diner & Shanghai Room at grab a Oaxaca Old Fashioned from Fred Moody after a long, hard day. Fred Moody is a retired journalist, author, and part-time bartender at the local North Star Diner & Shanghai Room (featured on Anthony Bourdain’s show, Part’s Unknown). Moody has been featured in the New York Times and the Wall Street Journal and has authored four books. You can buy his latest book, Seattle and the Demons of Ambition, here or on Amazon.